The Intercept, says former reporter made up quotes and sources. 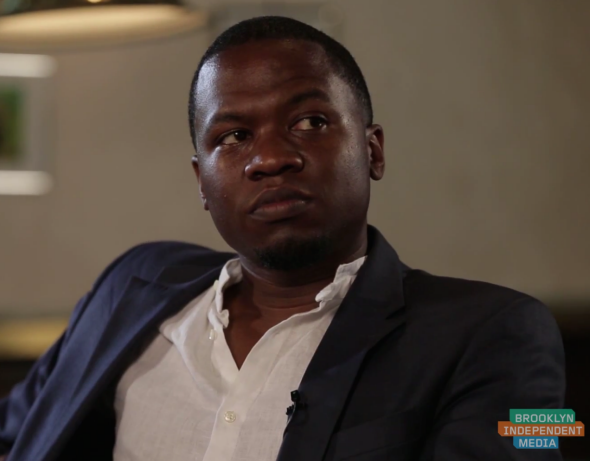 Former Intercept reporter Juan Thompson. The Intercept announced a series of fabrications by one of its staff writers, Juan Thompson, in a note posted on the site Tuesday from editor-in-chief Betsy Reed. Thompson was a staff reporter at the Glenn Greenwald, Laura Poitras, and Jeremy Scahill-founded investigative site with a national security bent for a little over a year before being fired in December. An internal investigation, Reed writes, showed that Thompson blatantly fabricated quotes in at least five stories. An investigation into Thompson’s reporting turned up three instances in which quotes were attributed to people who said they had not been interviewed. In other instances, quotes were attributed to individuals we could not reach, who could not remember speaking with him, or whose identities could not be confirmed. In his reporting Thompson also used quotes that we cannot verify from unnamed people whom he claimed to have encountered at public events. “Dylann liked her,” Scott Roof said. “The black guy got her. He changed. I don’t know if we would be here if not …” Roof then abruptly hung up the phone. After speaking with two members of Dylann Roof’s family, The Intercept can no longer stand by the premise of this story. Both individuals said that they do not know of a cousin named Scott Roof. J.K. Trotter over at Gawker has been piecing together more on Thompson, including this sprawling letter addressed to Betsy Reed in response to the Intercept’s accusations. In the letter Thompson says he is bed-ridden from undergoing radiation for testicular cancer. Ms. Reed, I also just read Counsel Oberlander’s letter. I’m not in NY and have been sick and bed-ridden from radiation so of course I can’t return that laptop—that I also broke by the way.